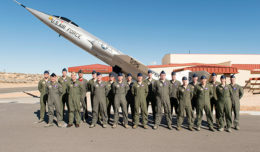 Airman 1st Class Alexander Cook, F-35 Heritage Flight Team Public Affairs, and Tech. Sgt. 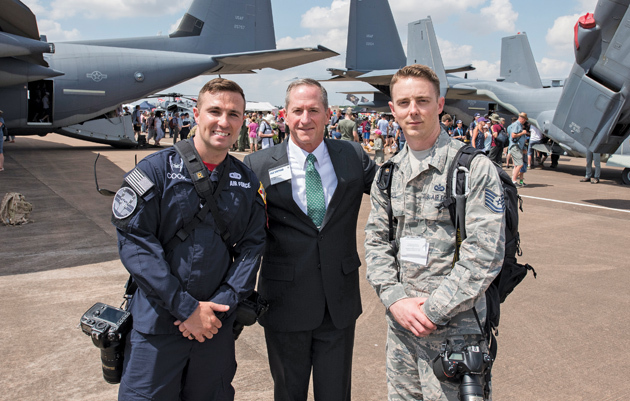 Brian Kimball, 501st Combat Support Wing photojournalist, pose for a photo with chief of staff of the Air Force, Gen. David Goldfein July 14 at Royal Air Force Fairford, England. As a member of F-35 Heritage Flight Team, Cook documents air shows around the world showcasing Air Force heritage. Have you ever had an opportunity come up in your Air Force career that you were unsure of? Has the thought of failure kept you away from your full potential? Some say it’s pure luck or who you know that determines what type of awesome opportunities you get to be a part of. While some of that may be true, it’s mostly the amount of hard work and dedication you put into your craft that creates those opportunities. Just over five months ago, I was handed the opportunity of a lifetime from my leadership; one that I thought would never be given to me this early in my career. I was given the opportunity to travel to air shows around the world and represent the F-35 Heritage Flight Team as the head of public affairs. Being in a position designed for a much higher-ranking individual, I doubted myself and was uncertain I could fulfill the role at first. Did I have what it takes? I didn’t know what I was really getting into. Whether it was coordinating and facilitating media interviews, creating and editing products for social media, or coordinating community engagement events, it seemed overwhelming at first. I’ll admit, at times it still does. Throughout working the air show season, I’ve been able to travel overseas as well as to cities around the United States. While traveling, I’ve been able to meet and work alongside other PA Airmen and develop new skills in my job. It’s a constant grind, but one that has truly given me a broader perspective on the public affairs career field. Don’t squander the opportunities that come up throughout your military career. Instead, embrace the challenges and you will learn to grow into a better leader from those experiences in the end. Most of the time, your leadership will not give you responsibilities that they think you can’t handle. When they task you with something that pushes you to your limits, it’s likely because they know you have the potential to find innovative ways of making something better. I encourage everyone to take advantage of the learning opportunities they’ll encounter throughout their career, and learn and grow as Airmen. 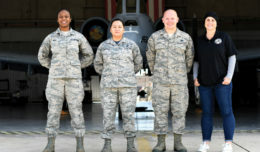 If I were to give advice to Airmen, it would be to take pride in the work that you do. No matter the scope of your responsibilities, big or small, do it with heart, because you may end up finding yourself with new opportunities you never knew were possible.